They spin nine hours every day, the roller coasters "Winja's Fear" and "Winja's Force" at Phantasialand, Brühl. They have a very good stand in the visitor's grace, because their highly complex technology offers a ride packed with action. For the smooth operation and the contentment of the riders there is more than a sophisticated control system needed, and in the first instance it's the staff of the inspections team. They care for the technical safety and the trouble-free operation. Their day begins at a quarter to five in he crack of dawn. And the team of coastersandmore.de is present, too. Read in the following article how "Winja's Force" and "Winja's Fear" are put through their paces for four hours every day. The two spinning coasters manufactured by the Munich-based company Maurer Söhne are the main attractions of the theme complex Wuze Town. Phantasialand presented this completely enclosed fantasy world for its 35th anniversary in 2002, taking the guests to the long forgotten civilization of the Wuze clan. Just like their offspring the visitor gets acquainted with gravity - on the Tittle Tattle Tree as well as on the two spinning coasters. Roller coasters with single cars that rotate during the ride aren't a spectacular novelty, but the tracks of the two ones at Wuze Town offer quite a few exclusive extras. So far unknown special effects like vertical lifts, see-saw and bagging elements mark the highlights of this trip through the mystic world of Wuze Town. At times the ride leads highly above the heads of the visitors, then the cars spin around a light-flooded rotunda to race through the darkness just an instant later. Technical inspections and maintenance works are essential before the two Winjas can begin their 9-hours long operation when the park opens in the morning. The as yet unknown complexity of those coasters demands an exceptionally accurate check prior to each start-up. It begins with the cars, continues with the security facilities and ends with the functionality test of the special effects. Coastersandmore.de attended this procedure for a whole morning, from the initial system check at 5am to the first rides with passengers. Wuze Town is an example of the Maurer Soehne Xtended SC 3000 with impressive theming. 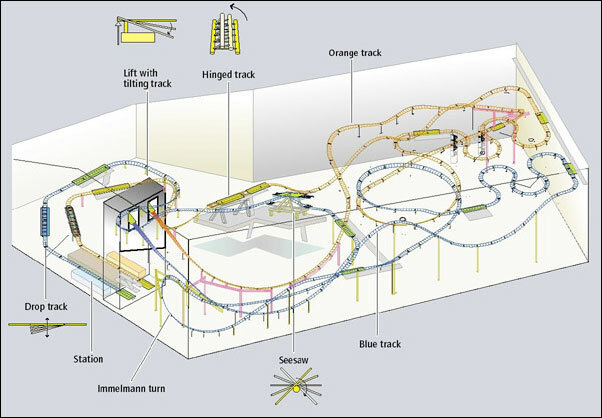 The indoor complex at Phantasialand near Cologne, Germany houses two separate spinning coasters: the blue track and the orange track. The two coasters start at a shared loading platform. Each then comes to a vertical express lift that catapults the four-person cars more than 17m (56 ft) upwards in a matter of seconds. Once at the top, there's no time for the passengers to catch their breath: instead, their cars are tilted sharply downhill with a great view of the first drop which suddenly appears. The blue track now plummets into the depths, followed by a camelback with airtime, before the cars shoot through the drop ceiling and enter the 240° turns on the second level. The turns create a highly dynamic rotating motion up to 20 cycles per minute. The blue and orange tracks meet again in a giant carousel with a diameter of 20 meters or 66 feet. The blue track then speeds 12m up into the Immelmann Turn. On an almost vertical stretch of track with an 80° banked high curve, the passenger then looks either up to the heights of Wuze Town or down into the depths. After passing through a tunnel, the car comes to a standstill at a 30° uphill angle. Accompanied by a musical backdrop and seemingly guided by an invisible hand, the car then moves to a new position where the track together with the car is pitched suddenly downhill. It immediately moves on and passes through several left and right-hand turns before the carriage is fixed in position for entry into the station using a special aligning mechanism. Before reaching the station, there's one last kick to surprise the passengers: the car suddenly disappears into the void for a moment. The orange track takes a totally different route. After the vertical express lift and the first drop the cars pass through numerous thrilling features - slalom line, camelback and hinged track, to name a few. Thee carriages spin all the while. We'd like to thank the Phantasialand Schmidt-Löffelhardt GmbH & Co. KG and the Maurer Söhne GmbH & Co. KG for the friendly support on realizing this article. Some portions of this introduction are taken from the Maurer Soehne website.